''Life is getting up an hour early to live an hour more'' author unknown. And at 804, with the sunrise over the ocean, you'll want to capture every moment of it from your balcony, so set your alarm and start living. A stunning restoration from the bottom up, this is the beach house dreams are made of. 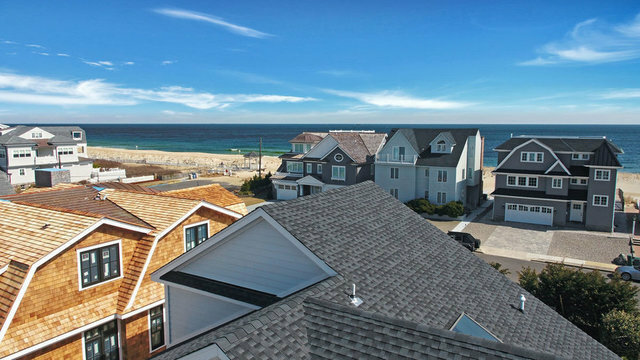 Nestled away in one of Sea Girt's most coveted neighborhoods and just steps to the beach. The Trenton Ave gazebo beckons you to the boardwalk and the beach awaits. Just around the corner sits Cornelius Park, with it's meandering dirt road, it is reminiscent of the Irish Countryside, and a canopy of evergreens and holly dot the road, shading the tennis & paddle courts that wait for some heated competition. Every floor in this home has been thoughtfully designed and curated with a coastal vibe and entertaining in mind. In addition to the magnificent gathering spaces the architect has tucked 5 bedrooms and 6 baths encompassing 3 levels. The first floor welcomes you in and offers a great room that opens graciously to a private stone terrace, 3 generous bedrooms, 2 full baths, a powder room, laundry and elevator to all three floors. The second floor is a testament to open space living. The chef's kitchen is done in a palette of crisp whites and soft grays, with custom cabinetry, butlers bar, a fabulous island that seats 6 comfortably and offers views of the ocean. It flows seamlessly into the living and dining spaces which open to a dining balcony with spectacular views. A charming study, fireplace, two baths and a private guest suite finish the second level. The third floor belongs to the master suite and it is all about the views. The ocean peeks in from almost every window, french doors take you out to the private balcony and the views are breathtaking. Soaring ceilings, his and her closets and spa bath complete this seaside escape.